As Saturday Night Live once said: "If it's not Scottish it's crap!" And this beer was certainly far from it. 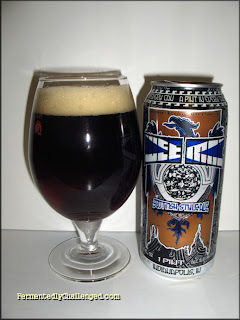 Today's review is of Sun King Wee Mac Scottish-style Brown Ale. This review marks another in a series of reviews from Sun King Brewing Company of Indianapolis, IN. Sun King puts out all of it's beers in either kegs or cans and this sample came in a nice big 16oz tallboy can. Wee Mac weighed in at 5.3% ABV and with a modest 23 IBUs. This brew is low enough in alcohol to make a session brew. I've had Scottish Ales before and also several Brown Ales but never one that was billed as both. For you calorie counters, this beer as about 207 calories per pint. I admittedly was in a rush to open this can and ended up spilling about 3 ounces out of this can, but no worries, this was still a full glass serving. Wee Mac is one of Sun King's year-round house beers and while it may seem like just one of their regular beers to the folks back in Indiana, here in Colorado, where Sun King doesn't distribute to, this was more like a rare treat. Appearance: Sun King Wee Mac poured a reddish mahogany color with a modest light tan head. The foam didn't stick around too long and left a slight slippery lacing on the glass that quickly slid away. The beer itself had excellent clarity with no haze and no visible sediment. Aroma: I noticed a nice mellow roasted malt aroma in this beer. There was some caramel sweetness in the nose and also some subtle citrus and earthy tones in it as well. Scottish ales seem to have a lot more malt dominance in the air than hops. Taste: This beer was creamy smooth from first sip to the very end. There was a sweet caramel malt taste here and just a mild bitterness. I could pick up some toffee characteristics from the malt as well. The brewer claims that there is a nice "hazelnut character" in this beer and there may well be, but I haven't had hazelnut enough to know the difference. There was just enough hop bitterness to prevent this beer from being cloying. Wee Mac had a bigger body than most brown ales and that was a nice change of pace. Overall: This beer got better as it warmed up a bit. This beer was an easy drinker and I found that after I finished the 16oz can that I still had room for more. While this beer was a darker color than most, it drank more like a Spring or Summer beer, meaning that I could easily enjoy this on a hot day as a cold one. This Scottish Brown ale tasted better than a typical Brown ale, it had a better malty character than typical brown ales. I would recommend it to anyone who likes a decent Brown ale. Browns used to be one of my stable beers, but as I've grown to love a lot more styles these days, brown ales seem to be more like an easy drinking every day type of beer. And well it should, it's good enough for year-round consumption. Drink this one when you want something with big malty taste, but not a lot of ABV or hops. Disclosure: This beer was given to me in a free sampler pack by the Sun King brewery directly. I was not paid to give this review. If you can't view the video via RSS or email please visit the blog or watch it on YouTube. Read more reviews on Brown Ales. - Sun King Batch 555: Isis Double India Pale Ale review.